When I’m not adding Shot of Gold turmeric into just about everything I make at home, from coffee to hummus to quinoa dishes, I’m tasting and testing turmeric drinks and dishes all over Toronto. Here are a few of my favorite spots in The Six to get your daily dose of anti-inflammatory magic. To me, Fresh is the OG of vegan joints in the city and I’ve been devouring their bowls and juices for as long as I can remember. When I was living in India and visiting Toronto, Fresh would always be one of my first stops, it’s that good. Shout-out to Fresh founder Ruth Tal, such an inspiration! 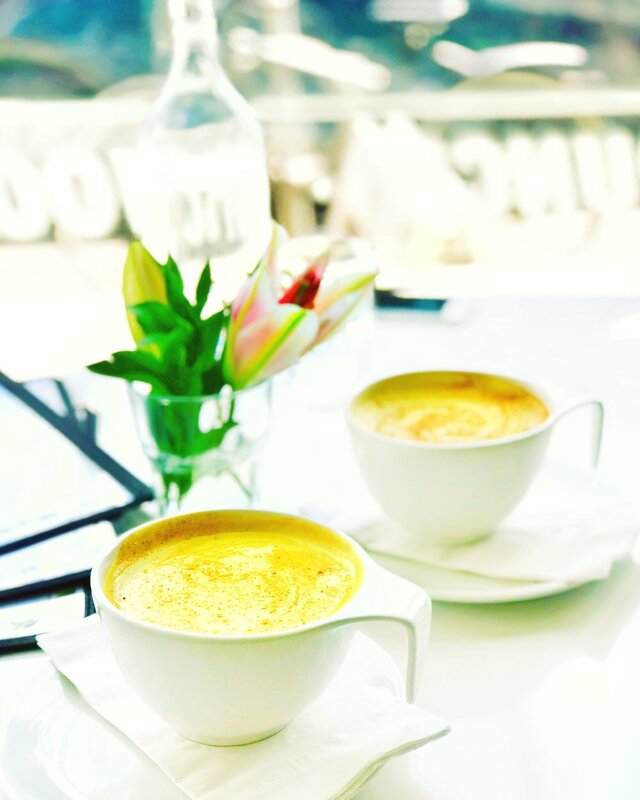 Try: freshly pressed turmeric and ginger juice with almond mylk, maple syrup and other spices makes this turmeric latte special! Try it cold this summer. Who doesn’t love kombucha on tap! I recently had their Craft Kombucha mixed with Hydrate & Heal juice (grapefruit, ginger, celery and turmeric – obviously!) and it was the most refreshing thing I’ve had since it got hot in TO. Try: Turmeric Booster Shots with freshly-pressed turmeric and orange juice with black pepper. The piperine in the black pepper increases the bioavailability of the curcumin by 2000% , allowing your body to absorb all the incredible benefits. There are so many Instagram-worthy nutritious and delicious dishes at Live (hello microgreens and edible flowers!) I wouldn’t know where to begin and the fact that their juices and meals are also available at grocery stores across the city is a testament to how many Torontonians love Live. Try: talk about genius, their handmade Turmeric Wraps are super healthy tortillas made with the earth’s most powerful anti-inflammatory, ensuring that no matter what’s inside you’re still getting all the benefits of this spice. Also, they’re beautiful! Try them the next time you have a summer BBQ or want to liven up your desk lunch. I’ve been friends with the sister duo behind BSF since before their restaurant opened, while I was living in Bombay (thank you power of Instagram!) A restaurant in my hometown of Toronto named after my favorite Indian city? Love! Not only is their vegan turmeric latte delicious, you can find my favorite spice in so many of their dishes. 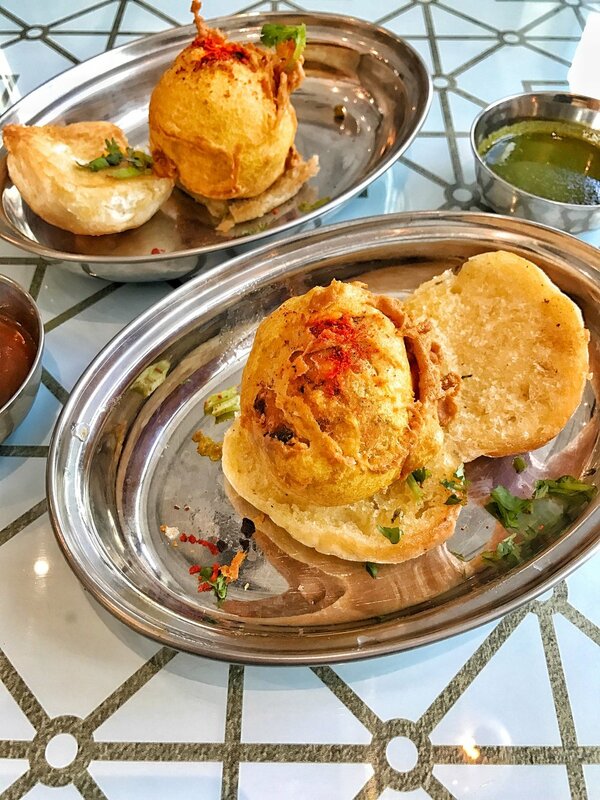 Try: the humble Vada Pav sandwich is the most famous of famous street food items back in Bombay and every time I have it here I’m immediately transported to the bustling streets of Mumbai (Bombay), India. It’s not healthy, per se, but it’s made with turmeric and worth every calorie! I love living in The Junction and try really hard not to leave; my favorite neighborhood vegan spot Grasshopper makes it even easier to stay local. When I feel like indulging I go for their Chick-Uhn Burger with sesame fries. (Insider secret: ask for half and half house and BBQ dressing.) I take my meat-eating friends here all the time and they love this plant-based imitation. Try: their turmeric latte is made with organic turmeric and comes in a giant mug. I love sitting in their sun-filled front window sipping this golden mylk. Try: turmeric cauliflower yaas! Impact Kitchen makes beautiful bowls with a handful of healthy ingredients, make sure to have their golden cauli in yours. PS They recently opened their second location in the heart of Toronto at Adelaide Street West and also make a gorgeous vegan beetroot latte. You can find me shopping here for healthy organic goods at least four times a week. They say millennials don’t have homes because of avocado toast, well, it’s Sweet Potato for me! Health is wealth so I consider it an investment. Follow them on Instagram for some fresh deals – I’ve seen 3 bunches of kale for $5 and $1 radicchio. They also have a great bulk section with juicy dates and whole almonds sometimes going on sale. Try: it’s my favourite spot to pick up fresh turmeric root, which I often grate on top of smoothies and different dishes I’m concocting at home.